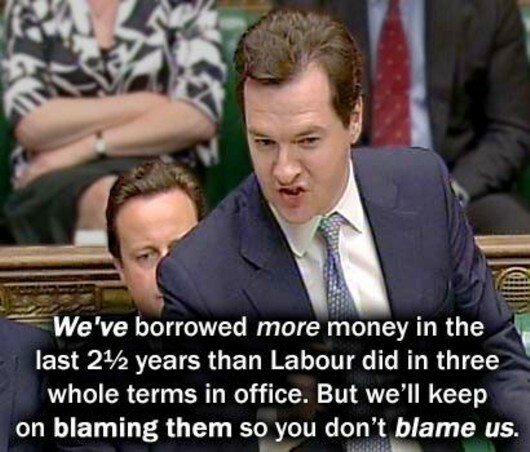 Why whine, Cameron? Labour can’t reverse Child Benefit cut because you cocked up the economy! Either David Cameron is suffering a touch of sunstroke left over from his foreign holiday, or he is suddenly happy to admit he is a braying buffoon. That is what we learned from his determination to continually harp on about Labour’s policy on child benefit during this week’s Wednesday Shouty Time (Prime Minister’s Questions). Also that he has no answer to any questions asked of him about the Coalition’s failure to manage the NHS, or indeed, the national economy. Ed Miliband’s first question today was about Accident & Emergency waiting times, but Cameron responded about child benefit. To the general public, that makes him a man with no answer. Pressed on the issue, Cameron resorted to his old standby – waiting times in Welsh hospitals. The last time Mrs Mike was at a Welsh hospital, she waited maybe 15 minutes, between the time she arrived and the time of her appointment. More recently, I had to take a neighbour to hospital for some emergency medication for a mouth abscess. She was seen immediately. And we live in Wales. (I’m not denying that the health service could be better but improvements are constantly taking place – and what’s more, over here, they make changes in consultation with the public! I mention this to make the distinction between it and, say, coming out with hugely unpopular plans, halting the process for a so-called “listening exercise”, paying no attention to the results of that exercise and pushing through the original plans regardless. That’s the Cameron method). We had no sense from Cameron about A&E – but was he making a good point about Child Benefit? Was Labour now supporting the Coalition’s decision to change it from a universal to a means-tested benefit, despite its bitter opposition when the cut (and don’t think it’s anything else!) was first announced. The fact is that, if Labour comes back into office in 2015, the party’s leaders believe it will be extremely unlikely that enough money will be available to fund the restoration of universal Child Benefit. That’s not a U-turn by Labour – it’s economic mismanagement by the Conservatives (and their little yellow enablers, the Liberal Democrats). 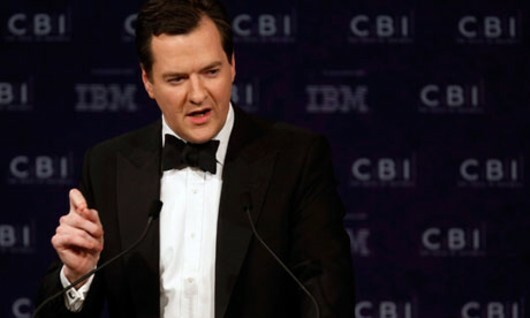 When George Osborne became Chancellor in 2010, he vowed to eliminate the national deficit by the next election in 2015. Some of you might have forgotten that; he said he would balance the books by then, making it possible for the (poor people of the) country to start on the national debt (because the rich people have parked £21 trillion in foreign tax havens and the Tories are determined not to do anything about it, even though collecting some tax would solve our problems in a stroke). The 2015 election is now less than two years away. You might think the Coalition has done well, as it continues to claim the elimination of a quarter of the deficit. That was announced in 2012. 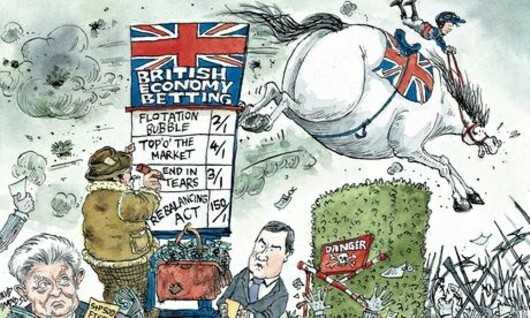 In the year to 2013, it eliminated something like a quarter of one per cent of the deficit – maybe even less! Borrowing continues to increase under this Coalition government. It has failed in its reason for existing. That’s why Labour won’t be able to restore universal Child Benefit. And that’s why David Cameron is a babbling buffoon. David Cameron must think we’re all as stupid as his fellow Conservatives and that party’s most rabid adherents, if the latest BBC report is to be believed. In it, he responds to comments from his Coalition government’s own Business Secretary, Vince Cable, suggesting the government could consider borrowing more – at, let’s remember, the lowest interest rates in British history – to inject some growth into the economy. Cable’s remarks are eminently sensible – which is, of course, why Cameron is believed to be moving so quickly to counter them. The fact is that austerity never – ever – brought a country out of debt. Investment is the key. Investment needs money. If you don’t have money, you borrow it from someone who does. Then you pay them back – with interest from your profits. ‘Speculate to accumulate’, as the saying goes. 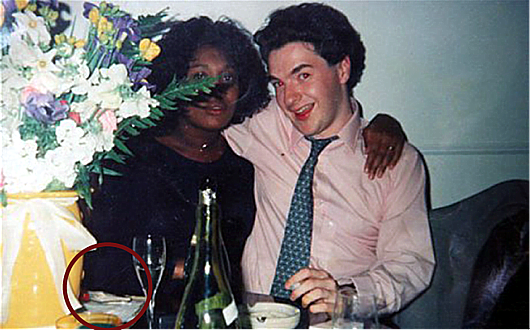 It’s how most Conservatives and Tory voters made their money but Cameron – and his sidekick 0sborne, let’s not forget – inherited theirs and therefore, we may reasonably deduce, know nothing whatsoever about it. Instead, Cameron will reiterate his insistence on following the ‘Starve the Beast’ policy that George W Bush used to such devastating effect when he was President of the USA, reducing a surplus of $128 billion to a deficit of $10.627 trillion within a few short years. A decent definition of ‘Starve the Beast’ economic theory is that it is a fiscal strategy to create or increase existing budget deficits via tax cuts to force future reductions in the size of government. This is clearly what Cameron and his cronies are doing – and the Liberal Democrats are helping them all the way, no matter what Cable says about it. It’s why they’ve borrowed more money in the last two and a half years than the Labour Party did in three terms of office (as a recent meme puts it). And they will cut the machinery of this country’s government down to the marrow, for no better reason than their own personal enrichment and the fact that it will create huge problems for any government that follows them in 2015. “I know some people think it is being stubborn to stick to a plan. That somehow this is just about making the numbers add up.” He’s setting us all up with a false premise. We don’t think he’s being stubborn; we know his real plan isn’t what he has been trying to sell us. It’s about cutting the state to nothing, impoverishing the vast majority of us in the process and enriching his cronies. This is why, crucially, the numbers don’t add up at all. “The very moment when we’re just getting some signs that we can turn our economy round and make our country a success is the very moment to hold firm to the path we have set.” So the present moment, with the loss of our ‘AAA’ credit rating, high street shop chains dropping like flies and his own political party regularly being dropped to third place in by-elections, would definitely not be that time. “And yes, the path ahead is tough – but be in no doubt, the decisions we make now will set the course of our economic future for years to come.” This is absolutely true. The decisions he makes now will set the course of our economic future for years to come. What a shame nobody seems able, or willing in the case of the Liberal Democrats, to stop him. “And while some would falter and plunge us back into the abyss, we will stick to the course.” He is projecting the effects of his own actions onto his political opponents. He knows perfectly well that it is his course that will lead us straight to that metaphorical abyss – if he hasn’t pitched us over into it already. The BBC article goes on to say that he will point to the creation of a million extra private sector jobs – a claim that has been debunked many, many times since he first made it. Private sector jobs have been created, but nowhere near a million of them! Also the terms under which people are being employed are appalling. It is typical of the kind of ridiculous babble to which he and his lieutenants have subjected us for nearly three years now – a period in which our situation has never – not once – offered even the appearance of improvement. This blog reported only a few days ago that Cameron had been put on notice by his own party – improve or lose the leadership. The sooner those backbenchers follow through on this threat, the better. The Nasty Parties’ (I include the Liberal Democrats now – let them all be tarred with the same brush) have voted to squeeze benefit increases to just one per cent for the next three years, after the third reading of the Benefits Uprating Bill in the House of Commons. That Bill will now go to the House of Lords, where I sincerely hope it will receive a more intelligent examination than many Conservatives and Liberal Democrats gave it in the other place. To help them with that work, I wanted to highlight some of the issues raised by opponents to the Bill, during yesterday’s debate. Firstly, the government is punishing people who are already hard-up for the failure of its own economic policy. As Stephen Timms said, we were promised that the policy would lead to steady growth and falling unemployment, but we got a double-dip recession, perhaps set to become triple-dip, depending on figures due this week. Unemployment is officially forecast to go up next year, so spending on unemployment benefits will go up, and borrowing will go up too. The government’s response is to force down the incomes of those who already receive the least in order to cover the cost of its mistakes; the saving made by the Bill’s measures will be about the same as the increase in social security spending. In April, the government will give a tax cut to everybody earning more than £150,000 per year, and for 8,000 people who earn over £1 million a year, that means a cut of around £2,000 a week. At the same time, someone receiving the adult rate of Jobseekers’ Allowance will get an extra 71p a week. The change in the personal tax allowance will not help people in work on low incomes. Citizens Advice has pointed out that “any rise in net earnings leads to a reduction in housing benefit and council tax benefit.” In fact the improvement for people in low-income work was recorded by Helen Goodman: 13 pence per week. Meanwhile, the average price of weekly grocery shopping has risen by 17 per cent and the energy companies have hiked up their prices by around 11 per cent. In fact the impact assessment tells us disabled households are more likely than others to be hit by the changes in the Bill. Child poverty is set to skyrocket, thanks to the measures of the Nasty Government. The Institute for Fiscal Studies tells us that, taking account of everything that the Government announced before the autumn statement, child poverty was already set to increase by 400,000 by 2015 and 800,000 by 2020. Although it was not mentioned in the autumn statement or the impact statement, and a question to the Minister has gone unanswered, the government has let it slip – in a statement by a different minister – that the three years of one-per-cent uprating will increase child poverty by 200,000 – on top of the increase that is already due. That means that we are on track for one million more children below the poverty line by 2020 – reversing all the progress made during the 15 years since Labour came to power in 1997. And that is only the figure the government has been prepared to acknowledge in relation to relative income. It has said nothing about the impact on absolute poverty, material deprivation or persistent poverty — measures to which it committed itself in the Child Poverty Act 2010. The Children’s Society estimates that the following professions are also affected: 300,000 nurses and midwives in the NHS; 150,000 staff in primary and nursery schools; 1.14 million admin workers, secretaries and secretarial assistants; 44,000 electricians and electrical fitters; 510,000 sales assistants and cashiers; and 42,000 armed forces personnel. 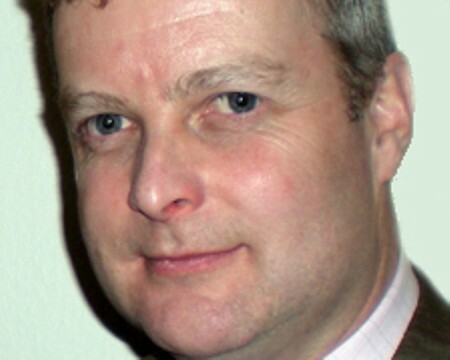 “We certainly want it to be more worthwhile for people to be in work, but forcing down the incomes of those who are out of work is not the way to do it,” said Mr Timms. I have been saying that, here, for many months, and it did my heart good to see that it had been said in the House of Commons. He said uprating should indeed be in line with inflation, as it always was in the past. He continued: “The Bill was designed by the Chancellor to promote his party’s narrow interest.” Yes – the Conservatives are a minority-interest party. This Bill, and the tax cut for those earning more than £150,000 per year, prove it. They support the super-rich; you and I don’t get a look-in. And he pointed out that the government did not need an Act of Parliament to restrict benefits upratings. 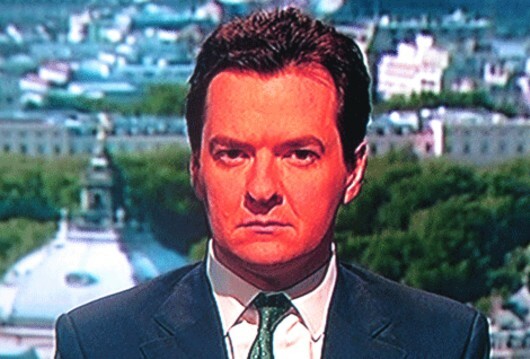 “The Chancellor thought he could boost his party’s standing if he introduced a Bill, so we have one,” he said. Absolutely correct. The plan was to make the Labour Party, in opposing the plan, look like the party of scroungers and slobs. Instead, the Conservatives have confirmed themselves as the ‘Nasty Party’, oppressors of those who most need government help. That is absolutely untrue. Labour ran a lower deficit than the Conservatives throughout its years in power. The increases in the deficit and the national debt were caused by the banking crisis. Conservatives and Liberal Democrats are on record as having supported what the then-Labour government did to solve the mess that was created by high-earning bankers (about whom the current government has done nothing worth discussing). They would have done the same thing and created the same debt. Fortunately, Ian Mearns was on hand to put Mr Elphicke right: “The hon. 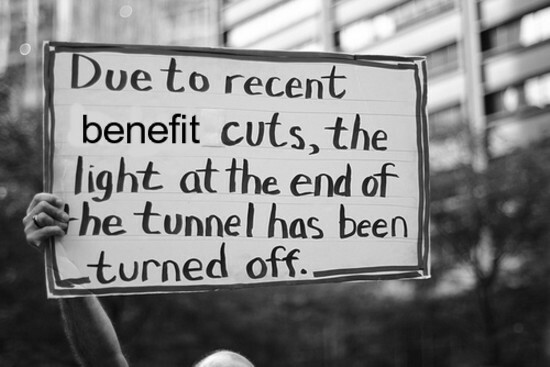 Member… forgot to mention that, while those on benefits have had their benefits uprated at twice the rate of those in work in percentage terms over the past five years, the actual increase in financial terms has been on average about £49 for those in work and about £12 for those on benefits. Lords, please take note. If any of you uses the argument about percentage increases, I sincerely hope to see others ask that person whether they will be supporting the government on the basis of something that has been proven – and is now known to the public at large – to be utter, meaningless nonsense. Leading questions: Surveys have been leading respondents by the nose for decades, on many different subjects. I learned about this trick years ago, when I was working for a broadsheet newspaper. There had been a great deal of debate over its page size in previous years, but this had been settled by a survey, written by the paper’s bosses (who didn’t want any change). Of course, the answer was a resounding “No!” People wanted value for money, and didn’t realise that they were being asked about the size of the paper’s pages and not the number of pages in the paper as a whole. You can see it for yourself if you like but I’ll quote it verbatim here anyway. Apparently they wanted an answer only a little longer than a tweet. In other words, one in which it is impossible to present a reasoned argument. It was still a little too long but I managed to shave a few bits off. Sadly (for the truth), I don’t think it matters. It’s the headline figure – the number of people who answered “No” to the two questions – that will give the Tories what they want. No doubt they hope to delude huge swathes of the voting population with their results. That’s why I’m publishing my response – in full – in this article. Please visit the site and see it for yourselves. Then – if you’re as disgusted as I am – make your opinion as public as you can. Hunter S Thompson once said of Richard Nixon that he was so twisted he needed help to screw himself into his trousers every morning. That could also be said of the Conservative Party. Let’s make sure they can’t screw the facts. These people are an obscenity.